An academic conference is a conference for researchers (not always academics) to present and discuss their work. Along with academic or scientific journals, conferences provide an important channel for the exchange of information among experts. Presentations are generally followed by discussions, in which participants exchange reactions and critiques. This exchange of ideas distinguishes the conference from other non-interactive forms of scholarly communication. Academic conferences are also places where scholars and professionals develop friendships and professional relationships. Today, developments in technology have begun to allow for Internet-based conferences. Generally, a work is presented in the form of a short, concise presentation lasting about 10 to 30 minutes, which is usually followed by a discussion. The works may be collected, revised and published as the conference proceedings. 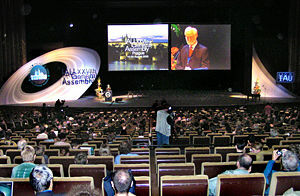 Often conferences feature one or more keynote speakers (usually scholars of some standing), whose presentation can last from 15 minutes to an hour. Panel discussions, roundtable discussions on various issues, or workshops may be a part of the conference; in particular, conferences related to the performing arts feature workshops. Prospective presenters are usually asked to submit a short abstract, which will be reviewed before the presentation is accepted for the meeting. Some disciplines require presenters to submit a paper of about 12-15 pages, which is peer reviewed by members of the program committee or referees chosen by them. In some disciplines, such as English and other languages, it is common for presenters to read from a prepared text. In other disciplines such as the sciences, presenters may use visual presentations to display figures and diagrams. A large meeting will usually be called a conference, while a smaller meeting is termed a workshop. They might be single track or multiple track, where the former has only one session at a time, while a multiple track meeting has several parallel sessions with speakers in separate rooms speaking at the same time. Depending on the theme of the conference, social or entertainment activities may also be offered. In a large enough conference, academic publishing houses may set up displays offering books at a discount. 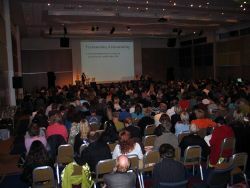 At larger conferences, business meetings for learned societies or interest groups might also take place. Conferences are usually organized either by an academic society or by a group of researchers with a common interest. Larger meetings may be handled on behalf of the academic society by a Professional Conference Organizer (PCO). An academic conference can be also called Convention or Congress. In academia, the proceedings are a collection of academic papers that are published in the context of an academic conference. They are usually distributed as printed books (or sometimes CDs) either before the conference opens or after the conference has closed. Proceedings contain the contributions made by researchers at the conference. They are the written records of the work that is presented to fellow researchers. The collection of papers is organized by one or more persons, who form the editorial team. The quality of the papers is typically ensured by having external people read the papers before they are accepted in the proceedings. This process is called reviewing. Depending on the level of the conference, this process can take up to a year. The editors decide the composition of the proceedings, the order of the papers, and produce the preface and possibly other pieces of text. Although most changes in papers occur on the basis of a consensus between editors and authors, editors also may have the authority to make changes. Since the collection of papers comes from individual researchers, the character of a proceedings is distinctly different from a textbook. Each paper typically is quite isolated from the other papers in the proceedings. Oftentimes there is no general argument leading from one contribution to the next. In some cases, the set of contributions may be consistent in quality and style and so the editors of the proceedings may decide to further develop the proceedings into a textbook (this may even be a goal at the outset of the conference). Proceedings are published in-house, by the organizing institution of the conference, or via an academic publisher. For example, the Lecture Notes in Computer Science by Springer Verlag include much of their input from proceedings. Increasingly, proceedings are published in electronic formats (CD) only, or distributed on the Internet. A number of academic journals also use this name in their title, for example, Proceedings of SPIE, although, in the area of science, the quality of publications in proceedings usually is not so high as that of international scientific journals. The abstracts usually undergo peer review after which they are accepted or rejected by the conference chair or committee and then allocated to conference sessions. The abstracts may be presented as an oral talk or as an illustrated poster during the event. Abstracts are often published before or after the event as conference proceedings or in academic journals or online. In some cases submission of a full paper may be required before final acceptance is given. In some fields (for example, computer science), most mainstream conferences and workshops ask for the submission of full papers (rather than just abstracts) and academic program committees peer review the full paper to a standard comparable to journal publication before accepting a paper for presentation at the conference and publishing it in an edited proceedings series. Fresco from the Tomb of the Diver. 475 B.C.E. Paestum National Museum, Italy. Symposium originally referred to a drinking party (the Greek verb sympotein means "to drink together") but has since come to refer to any academic conference, or a style of university class characterized by an openly discursive rather than lecture and question–answer format. Web conferencing is used to conduct live meetings or presentations via the Internet. In a web conference, each participant sits at his or her own computer and is connected to other participants via the Internet. This can be either a downloaded application on each of the attendees computers or a web-based application where the attendees will simply enter a URL (website address) to enter the conference. A webinar is a neologism to describe a specific type of web conference. It is typically one-way, from the speaker to the audience with limited audience interaction, such as in a webcast. A webinar can be collaborative and include polling and question and answer sessions to allow full participation between the audience and the presenter. In some cases, the presenter may speak over a standard telephone line, pointing out information being presented on screen and the audience can respond over their own telephones. There are web conferencing technologies on the market that have incorporated the use of VoIP (Voice over Internet Protocol) audio technology, to allow for a truly web-based communication. Webinars may (depending upon the provider) provide hidden or anonymous participant functionality, enabling participants to be unaware of other participants in the same meeting. In the early years of the Internet, the terms "web conferencing" was often used to describe a group discussion in a message board and therefore not live. The term has evolved to refer specifically to live or "synchronous" meetings. 2003. "How to Organize a Telephone Conference." Meetings and Conventions. 38 (1): 48. 2006. "Education Leadership Conference—How to Avoid the Courtroom During Academic Disputes." Monitor on Psychology: A Publication of the American Psychological Association. 37 (10): 38. Bowman, Joel P. 1994. "Pity the Program Chair: A Brief Guide to Preparing Academic Proposals." Bulletin of the Association for Business Communication. 57 (1): 63-65. Bunker, Barbara Benedict, and Billie, T. Alban. The Handbook of Large Group Methods Creating Systemic Change in Organizations and Communities. The Jossey-Bass business & management series. San Francisco: Jossey-Bass, 2006. ISBN 978-0787981433. Conference on How to Organize the Unorganized. Proceedings of Conference on How to Organize the Unorganized. Philadelphia, PA: Labor College of Philadelphia, 1928. ISBN 978-6610517572. Docherty, Karen, and Angi Faiks. 2003. "Webinar Technology: Application in Libraries." Science & Technology Libraries. 25 (1/2): 211-226. Downing, Marolyn. "Conference English: A Guide to English for International Meetings for Participants in Conferences for Academic and Research Institutions and International Agencies." Kielikeskusmateriaalia 110. Jyväskylä: Korkeakoulujen kielikeskus, 1994. Jones, Martin. How to Organize Meetings: A Handbook for Better Workshop, Seminar, and Conference Management. New York: Beaufort Books, 1981. ISBN 9780825300110. Maitland, Iain. How to Organize a Conference. Aldershot, Hampshire, England: Gower, 1996. ISBN 978-0566075520. McCloskey, D. N. 1994. "How to Organize a Conference." Eastern Economic Journal. 20 (2): 219. Ninomiya, Y. 1994. "How to Organize an International Conference: HDTV Workshop Case Study." Terebijon Gakkaishi Journal of the Institute of Television Engineers of Japan. 48 (9): 1129. Platt, A. M. 1993. "How to Overcome Fear and Loathing on the Academic Conference Trail: Practical Tips for Beginners." Social Justice. 20 (3/4): 179. This page was last modified on 17 May 2018, at 21:57.